What’s better than spending a lovely fall day hiking to a great view or waterfall? 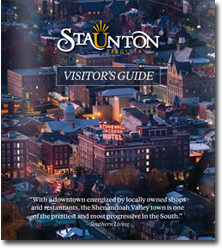 Staunton is a natural home base for your Shenandoah Valley adventures where the options are almost unlimited, for everyone, from casual day-hikers to trail-savvy backcountry gurus. Just outside town, the southward-winding Blue Ridge Parkway is a portal to more than 300 miles of trails, while Skyline Drive provides access to more than 500 miles of hiking trails in the Shenandoah National Park. 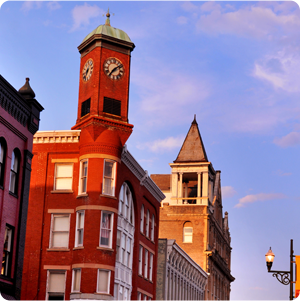 This doesn’t even include the two massive national forests—the George Washington and Jefferson National Forests—that flank this mountain-fringed town. If you’re up to chasin’ waterfalls, Elliot Knob is a great place to start. West of downtown Staunton near Buffalo Gap, Elliot Knob is the highest point in Augusta County and the closest hike for stunning views of the Shenandoah Valley. The trail is 8.5 miles to the summit, and still considered to be a hidden gem in the grand scheme of Virginia’s best hikes. Two significant and other minor falls are along the trail. Be cautious of slippery algae, but feel free to take off your shoes and chill out a while. The second major set of falls (marked by a cairn) is a great place to have a quick picnic. The flat rocks are begging you to perch, sunbathe, and enjoy a bright sunshiny day. 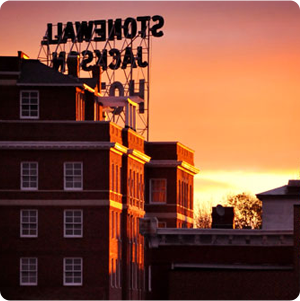 If care to march on, a grassy summit with incredible Shenandoah Valley views awaits. > Parking: Virginia Route 42, pull-off to a gated area with a stop sign and an additional brown sign on the post marked “291.” Use “854 Little Calf Pasture Highway, Swoope, VA” as the address for GPS. Extend the Elliot Knob hike by going around the backside of the mountain and trying Chimney Hollow. It’s a longer hike with more elevation gain, causing it to be rated 5 out of 5 in terms of difficulty. However, the views are worth the challenge (also rated 5/5). All said, the point-to-point hike is 15.4 miles, but can be shortened by parking at Route 688 instead of Route 42 (the Elliot Knob parking point). > Parking: Virginia Route 250, before Route 715. A non-descript pull-off on the right side of the road with coordinates of 38.27490, -79.29710. Have a partner leave another vehicle at the Route 688 lot (38.21332, -79.29599) or the Route 42 lot. Farther out Route 250 is the Ramsey’s Draft Wilderness Area, which delivers a 16.8-mile loop that an overnight to accomplish. The Ramsey’s Draft Trail is highly rated across all HikingUpward categories, which means you’ll work your tail off, but the rewards are equally tremendous. Expect steep ascents along two ridges in this loop, which will yield great views and really nice camp sites. You’ll dart back and forth across the stream as you go (be prepared for wet feet), and the trail has a tendency to be invisible in a few places due to rocky outcrops. Be aware of stinging nettles on the clockwise ascent. As with all wilderness areas and Virginia outdoors in general, leave no trace. If those before you left evidence of their presence, please pack out what you can. > Parking: Virginia Route 250, right on Ramsey’s Draft N (38.30828, -79.36090), go 100 yards beyond the Mountain House Picnic Area. Humpback Rocks once served as a landmark for wagon trains trying to cross the Blue Ridge in the 1840s. The trailhead for this popular hike is on the Blue Ridge Parkway and not far from I-64. Since the parking lot is usually well-populated, you might have better luck parking at the visitor’s center and strolling to the trailhead through the interpretive farm, which represents the regional architecture of the late 19th century. The mile to the top is a steep, hard hike. Rocks stud the trail, but you won’t forget you’re close to civilization as there are occasional steps and benches. The beautiful views of the Shenandoah Valley and Shenandoah National Park at the top are worth every step. This spot can score you amazing photographs, but you might have to shoot creatively around other hikers. The most popular route is only two miles round-trip; however, if you’re looking for something longer, HikingUpward.com suggests adding two additional miles along the Appalachian Trail. The longer hike provides a gradual descent (your quads will thank you) and solitude that the well-traveled up-and-back does not. 1,200-foot Crabtree Falls, one of the highest vertical-drop cascading waterfalls east of the Mississippi, features five major cascades and many smaller ones. This great hike along and up a waterfall pays off almost immediately. In fact, the first section of the paved, nearly flat trail leads to a viewing platform from which you have an excellent view of the lower part of the falls. Don’t let the ease of this beginning fool you, though, because from here on out, the trail becomes steep. The switchbacks repeatedly reconnect with the falls, offering the interest of several vantage points and viewing platforms. Steps and railings provide safety in some of the steepest, slipperiest sections. Rest and snack awhile at the large, walled area on top, and take in the rhododendron and the magnificent view of the Tye River Valley. Though it will be tempting to children and photographers, don’t leave the trail to climb on the slippery rocks. While the up and back might be plenty (3.8 miles), those really wanting to break in their boots, might try the longer route connecting Crabtree Falls with another spectacular hike, Spy Rock (13.9 miles). Wanna see something you don’t see every day? There’s a plane crash site on Dobie Mountain just off the Blue Ridge Parkway. You’ll need to park at the very popular Humpback Rocks area to get there, but trust us, this is a really great redirection from the crowds that flood Humpback on the weekends. Following the trail notes at Hiking Upward (linked above), you’ll be able to skirt off the trail for an excellent overlook of the Rockfish Valley and Nelson County before looping back around to see the 1964 wreckage of a lost Beechcraft*. Make time to get sidetracked for the sake of a great lunch venue, too: the Old Dominion Appalachian Trail Club shelter and Mill Creek. * Do not disturb the Beechcraft crash site. Not only is it disrespectful, but you could cut yourself on metal or come upon a venomous timber rattlesnake. One final waterfall for you! The hike from White Rock Gap off the Blue Ridge Parkway to Torry Ridge features a 30-foot waterfall – White Rock Falls – with a caveat. You must hike the trail after a good spring rain for the falls to materialize. And when they do? Magic. One of the cool things about this hike is that it passes through Sherando Lake campground, which has picnic tables for your lunch, and a lake with a beach area, if you feel like chilling out. The views along this trail are best in early spring (Hey! You’re right on time with spring break! ), as the trees will not have fully leaved yet.